When I was growing up my mother had a small gold mesh evening bag. Whenever she'd take it out of her closet, I knew she had some big-night-out plans. That it was incredibly teeny--it could probably hold a lipstick and car keys--was irrelevant. The bag was so elegant and shimmery it was like a piece of jewelry. 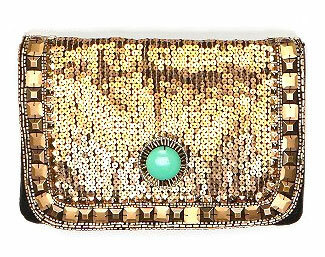 Perhaps this explains my attraction to this gleaming, gem-studded clutch. It's not quite as small as my mother's, which is a good and practical thing for us iPhone-generation types, but it is certainly as festive and glamorous.